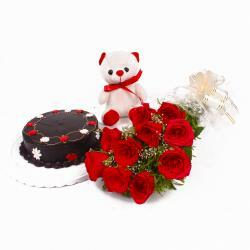 Product Consist : Bunch of 10 Red Roses and Half Kg Eggless Chocolate Cake along with Teddy Bear (Size : 12 Inches). Sorry! This product can not be delivered to selected city. This is one gift pack that you will definitely want to Gift. The pack contains a bunch of gorgeous red roses which have been neatly packed in cellophane and come with a matching ribbon bow. These beautiful flowers will soothe the senses of every recipient while the chocolate cake represents indulgence like no other. Also adore with cute teddy bear. These traits make this gift pack the perfect bet for many an occasion including Womens Day, Diwali, Navratri, Anniversaries and even Birthdays. This pack will wow all your loved ones with consummate ease. Along with this, send other Gifts to India through Giftacrossindia.com to be delivered in a safe and speedy mode. 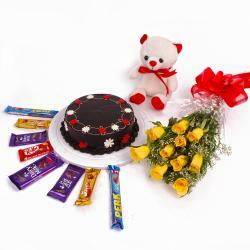 This gift hamper contains : Bunch of 10 Red Roses and Half Kg Eggless Chocolate Cake along with Teddy Bear (Size : 12 Inches). Kindly note the points mentioned below. The image displayed is indicative in nature. Actual product may vary in shape or design as per the availability. Flowers may be delivered in fully bloomed, semi-bloomed or bud stage. The chosen delivery time is an estimate and depends on the availability of the product and the destination to which you want the product to be delivered. 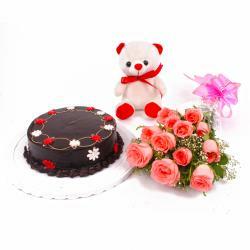 Since flowers and cakes are perishable in nature, we attempt delivery of your order only once. The delivery cannot be redirected to any other address. This product is hand delivered and will not be delivered along with courier products. Occasionally, substitution of flowers/flavors/designs is necessary due to temporary and/or regional unavailability issues. The icing, design of the cake may vary from the image depending upon local availability. Actual delivered flower's design/ pattern may vary as flowers are sourced from local city vendor & arranged manually.